With many offices today having more relaxed policies, it isn’t uncommon to see dogs and cats roaming in between cubicles or taking afternoon naps under windows. 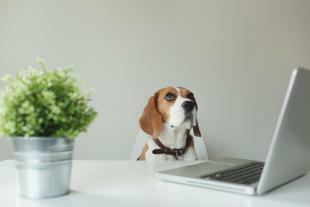 Pets can be a great addition to an office, boosting office morale and creating a more enjoyable workspace. While some people love office dogs and cats, others do not, and the last thing you want in bringing your pet to the office is to hurt relationships with coworkers. For this reason, it is crucial to make sure it is acceptable to bring in your pet.. If you’re thinking about bringing your pet to work, check through these four things before Mr. Snuggles walks through the door. One of the most common distractions in an office setting is loud noise. If your dog has a tendency to bark when it sees someone pass by the window, it might have to stay at home. Same thing goes for your cat that meows when it gets hungry. Unfortunately for pet lovers, the noise doesn’t have to even be all that loud, but if it is a repetitive act, your pet might not be welcome in the office. Even some of the most well behaved dog and cat breeds can’t help themselves from leaving behind fur everywhere they go. Cat and dog hair is not only a nuisance to clean up, it also often leads to allergies and a whole lot of sniffling. Your office Kleenex box might be gone in no time if your cat or dog sheds. For this reason, pets that shed should normally be left at home. Since your coworkers close to your desk will be interacting with or near to your dog or cat, it is vital to ask them for approval first. Be sure to ask for approval in an open and polite manner that doesn’t make them feel pressured to say it’s okay. As much as you may want Lassie to be by your side, it is important to respect your coworkers and the office relationships. Many companies do not specifically address pets in the office in employee handbooks, but it is still important to consult with your HR department before bringing Scout into the office. Much like with your coworkers, be sure to approach this approval openly and politely to not cause further controversy. If you have checked off these requirements, then congrats, you can now bring your pet into the office! Offices can feel even more like home with your pet lying by your side. Just remember, for the sake of your coworkers, be sure it is okay before you act. Have any suggestions or office pet stories of your own? Let us know in the comments!